Reclaim your kingdom. With cards! A captivating story and varied card battles ensure this light-touch RPG remains entertaining throughout its lengthy campaign. What is it? An adventure game with RPG systems and card-based combat. I'm trying to drink a dwarf under the table. He's currently ahead, but our competition has drawn spectators and I'm buoyed by the attention. I take a chance and play a card that consumes my remaining actions—in this instance, the ability to quaff a drink—and returns them twofold on the next turn. The dwarf continues to drink at a steady pace. On the next turn I'm rewarded with an abundance of actions, but it's still not enough. I play another card that lets me take two drinks per action. That does it. The battle is won. I am the best at outdrinking a dwarf via abstract card abilities. In The Witcher 3, Gwent is a card game that depicts warring armies. In Thronebreaker, warring armies are depicted by the card game Gwent. The difference is important: where The Witcher 3's Gwent was a fixed minigame with consistent rules, Thronebreaker's card-based combat warps and shifts based on the current situation. Usually, that means war, but sometimes it means a drinking game, a boss fight against a tough monster, or a stealth mission to slip past patrolling guards. If you've come to Thronebreaker to play pure, unadulterated Gwent, look elsewhere—to the free multiplayer version, Gwent: The Witcher Card Game. This singleplayer story is primarily an adventure RPG about a queen, Meve, and her journey to take back her throne. Betrayed and usurped after a Nilfgaardian invasion, she must travel the neighbouring lands, looking for allies, helping solve local disputes and battling Nilgaardian armies and Scoia'tael raiders. One of my favourite things about Thronebreaker is that it offers a new perspective on The Witcher's world. Geralt is a mutant. An outsider. As such, his relationship with the Scoia'tael—the Northern Realms' guerilla band of elves and dwarf resistance fighters—is often fraught but sympathetic. Meve, though, is human, and queen of Lyria and Rivia. There is no chance of reconciliation with the Scoia'tael—they're your enemies, through and through. And while the story still briefly covers their side of the story, your army and allies are unconcerned with their plight, and react accordingly if you show them leniency. As in The Witcher games, you're often asked to make plenty of tough choices on your journey. Local disputes rarely have a clear cut answer, and the people who wrong you often have what—in their minds—is a good reason. Even a wyvern's attack of a village isn't as one-sided as it might seem. You're often under pressure to do the wrong thing for the right reasons, but even doing the right thing rarely leads to a happy outcome, at least in terms of the story you're being told. In terms of systems, though, there are rarely any major consequences for your actions. That's because the card game that drives all of Thronebreaker's encounters is actually pretty easy. Thronebreaker isn't about Gwent as you'd know it from The Witcher 3. The basics are the same—it's still a game in which two sides take turns to play cards, working to utilise each card's special ability to either grow in power or attack your opponent, reducing their power in turn. But around that core concept, major changes have been made. There are only two rows per side, instead of Gwent's three. And where Gwent is always a best-of-three, the majority of Thronebreaker's battles take place over one round. The most important change, though, is that Thronebreaker doesn't view balance in the same way as Gwent, because RPG power progression is at odds with competitive 'fairness'. That can make fights increasingly easy—at least on the medium difficulty setting that I played. As you click-and-drag to move Meve around the map screens, you'll find resources that grant you gold, wood and recruits. You use this resources to train units—new cards for your deck – and upgrade your camp. The best camp upgrades let you build new cards, or replace your key cards with outright better versions. The default version of the Strays Bomber, for instance, sets an enemy row on fire—with a 33% chance to do damage to cards on that row every turn. The upgraded version has a 66% chance of doing damage. It's just better, and you're deadlier for having it. Other upgrades increase your Recruit Cap, letting you place more cards into your deck. Anyone who's played previous versions of Gwent will know that more cards isn't necessarily a good thing—a key concept of multiplayer Gwent is thinning, burning through your deck to ensure you draw the most powerful cards by the final round. Thronebreaker doesn't view balance in the same way as Gwent, because RPG power progression is at odds with competitive 'fairness'. Here, though, thinning is never an issue. There are enough powerful card combos that you'll always have plenty of ways to win. I might draw Wagenberg, which gains attack power each time a unit is played on its row, with War Wagon or Rivian Pikeman, which spawn or draw extra cards onto the board. Or I'll draw Lyrian Scythemen and Lyrian Arbalests, both of which have the Loyal trait that procs an action every time I use Meve's leader ability—which is on a reduced cooldown thanks to my Lyrian Banner card. There are even cards that operate outside of your draw, like the Gheso Arbalest, who appears on the battlefield at the start of the first round, thus bypassing the initial draw entirely. As a result of all these options and my many upgrades, I've created a deck with ridiculous damage output, whatever I draw. I've finished most standard battles with an absurd lead, as the AI opponent struggles to play anything that can outpace my various engines of destruction. By far my most ridiculous pairing was of Black Rayla, whose Order ability lets me play any card from the deck, with Xalvier Lemmens, who can recharge Order. With them, I'm able to play three cards of my choosing in one turn, regardless of draw. These are both gold cards, representing specific, named characters who Meve meets and recruits on her travels. These characters all play into the story, too. All have their own beliefs and prejudices that they follow, and thus they'll join or leave based on your actions. Not to spoil the specifics, but the Rayla/Lemmings combo wasn't available to me for long. I do wish a little more had been done to tie the story to your available cards, because it's by far the most interesting consequence of your actions. Missing out on some resources because I chose a specific option rarely feels like a major punishment. But losing a favoured card is a clear reaction to Meve's decisions. The extreme version of this that Thronebreaker never toys with is forcing you to rebuild your deck. Those Lyrian Arbalests have been with me since the beginning of the game, and have remained a powerful enough option that I've never felt the need to remove them and experiment with other possible configurations. The way deck building is implemented does reflect your campaign of alliance and growing power, but it comes at the cost of never really needing to think through your deck's composition. The mix of exploration, story and battling would all feel too slight if not for the sheer variety of scenarios. Thronebreaker is a strange and interesting curio. Its maps are a beautiful, painterly depiction of bleak, war torn lands, and its story is a well told tale with a sympathetic, no-nonsense lead. But the mix of exploration, story and battling would all feel too slight if not for the sheer variety of scenarios. Key story fights are often fun and surprising, with special conditions like powerful fighters to target or allies to defend. My favourite battles, though, are the puzzle missions you find out on the map. These ignore your prebuilt deck entirely, giving you specific, often unique cards, and ask you to achieve a particular goal. Clearing out monsters, for instance, usually requires reading the specifics of how they attack, and turning their traits against them. In one fight against elementals, I was asked to balance the health of one that spread fire and halved its health every two turns, with another that consumed and doubled its health every other turn—like an algebra puzzle featuring angry rock monsters. Most centre around a specific Gwent mechanic, like consuming dead units from the graveyard or charging Order to trigger actions. Others are just silly and fun, like drinking a dwarf under a table. The rewards for these optional puzzle missions aren't so great that they're essential to complete, but I did them all anyway—sometimes coming back to them once I'd taken the time to really think about how to make three monsters, who grow in power at different rates, have the same health so I can Scorch them all at once. Thronebreaker's scenario variety is the crucial final element that makes it feel like time well spent, even as I approached the 30-hour mark. It's too light on systems to be a fully fledged RPG, and too unbalanced to be robust and challenging card game. 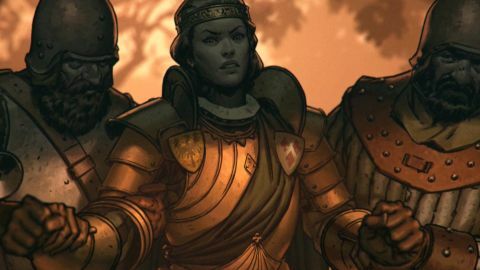 But through a great story, surprising, enjoyable encounters, and a new spin on The Witcher's world, Thronebreaker carves out a niche that's well worth your time.